Today’s fast-paced and painfully polarized world presents special challenges for all of us committed to the Dharma practice of “right speech.” For most of us this is particularly true in the digital realm where there is a strong impulse to react immediately. Dawn from the rooftop of San Francisco Zen Center’s Beginner’s Mind Temple in San Francisco. 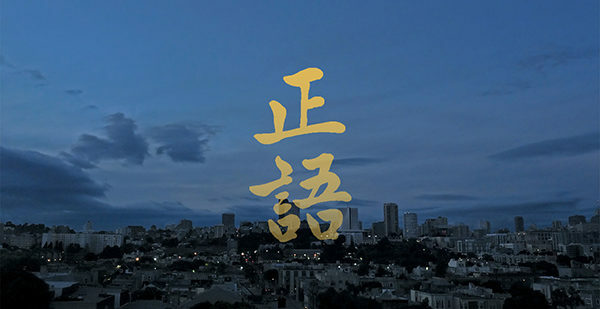 Photo by Shundo David Haye; calligraphy “Right Speech” by Gendo Lucy Xiao. When our deeply held values are threatened, we naturally want to stand up for what we believe is just. As practitioners of the Buddhist path, we vow to express ourselves without creating more suffering. The first step is to pause and ask: “Am I calming the situation or inflaming it?” With great compassion and without judging ourselves, we step out of our story to observe our anger, fear, or other strong negative emotions, and to feel our physical sensations. We refrain from acting until we’re in a state of calm, abiding presence. In this way, our fierce attachment to “how things should be” softens. Kindness and awareness arise. Then we can join even the most difficult conversations with disarming clarity and open-heartedness. This is not an easy thing to do. Yet it is the way to shift our consciousness and break the endless cycles of suffering. At San Francisco Zen Center, we aspire to create a world where compassion and wisdom are abundant and right speech is the norm. We help many thousands of people annually at Green Gulch Farm, Tassajara, City Center, and online to become more awake, dissolving the dualism of us and them. Right speech is the powerful and necessary Buddhist antidote to the highly aggressive tone that dominates so much public discourse today. We invite your financial support so we can expand our public programs next year and offer greater access to the transformative teachings of the Buddha. May all people experience the joy of living mindfully, which includes the life-long practice of right speech. P.S. To read “A Conversation with Fu Schroeder on Right Speech” please visit www.sfzc.org/rightspeech.